Who doesn’t love croissants? That delicious soft, melting texture of warm buttery pastry is like a taste of heaven. But all those calories! 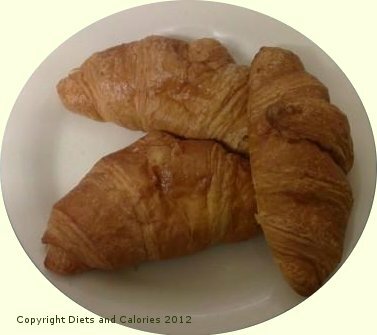 The average plain croissant has over 200 calories and more than 10g of fat. Anyone watching their weight would be best advised to steer well clear of such a treat. Fortunately, not all croissants are quite so sinful. 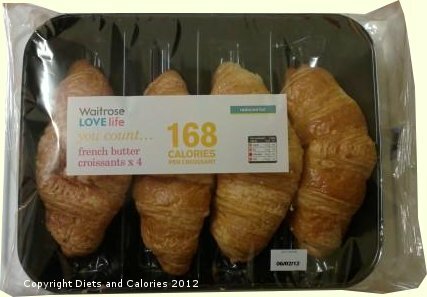 Waitrose LOVE life ‘you count...’ have a reduced fat version of French butter croissants which taste every bit as delicious as the full fat variety. Although each croissant has just 168 calories, they're still not a 'healthy' food choice. But if you can’t resist the odd croissant now and again, then choosing one that’s lower in fat (and calories), but still tastes rich and buttery, then these French Butter Croissants from Waitrose are a fantastic compromise. They're available in packs of four croissants and are suitable for freezing. Serve them warm by heating in the oven or microwave for 2-3 minutes or eat them straight from the pack. Either way, they're totally delicious. Nutrition information per croissant: 168 calories, 4.3g protein, 20.4g carbohydrate, 2.3g sugars, 7.4g fat, 4.8g saturates, 1.3g fibre, 0.35g salt. Suitable for vegetarians.